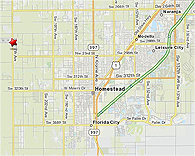 Homestead General Airport has typically served flight training and sport recreational aviation needs. This trend is changing due to the increase of corporate charter activity as a result of the growth in south Miami-Dade County as well as Homestead Speedway’s daily and large-scale NASCAR, Indy Race League (IRL) and Grand Touring Over (GTO) racing events which have increased Airport activity by 25%. 10/28 - 3,000' X 75 ' VFR (No instrument approaches) Asphalt. 18/36 - 4,000' X 100' VFR (No instrument approaches) Asphalt. 9U/27U - 2,500'X 150' (Ultra Light and Glider Rwy) VFR Turf. Located at Kendall-Tamiami Executive Airport, the Miami Automated International Flight Service Station serves the pilot community. For information call 1-800-WXBRIEF. For more information, contact us via email.